The world’s biggest book fair is happening right now in Yangon, the former capital of Myanmar. In the standard Big Bad Wolf international format, Andrew Yap and Jacqueline Ng have taken 2 million new English-language books to Myanmar, where a crowd of 500,000 is expected. Yes, read that twice. 2 million new English-language books have been shipped to Myanmar (Burma for you older folks) and a half million eager booklovers are expected to descend on the venue, which will be open 24 hours a day to meet demand. The event opened Friday 18 January and will run until midnight 28 January. Big Bad Wolf has an exclusive deal with Little Hippo to sell Little Hippo Augmented Reality books at the event alongside its two million regular titles. Myanmar is experiencing tremendous socio-economic change and there is an increasing demand for affordable books due to the growing importance of English proficiency. We understand that establishing a knowledge-based economy, nurturing the next generation of readers and embracing change in Myanmar, in line with the government’s policies and goals can be achieved by igniting a reading movement in Myanmar. When I learned about the Big Bad Wolf Books sale through a friend and met with the founders, I realized that this is something I must introduce to Myanmar. I’ve been dreaming of this for a long time. More on the Myanmar Big Bad Wolf event as news emerges. Meanwhile, the Big Bad Wolf team have not been sitting idle. The first Philippines book sale of the year has just been announced. 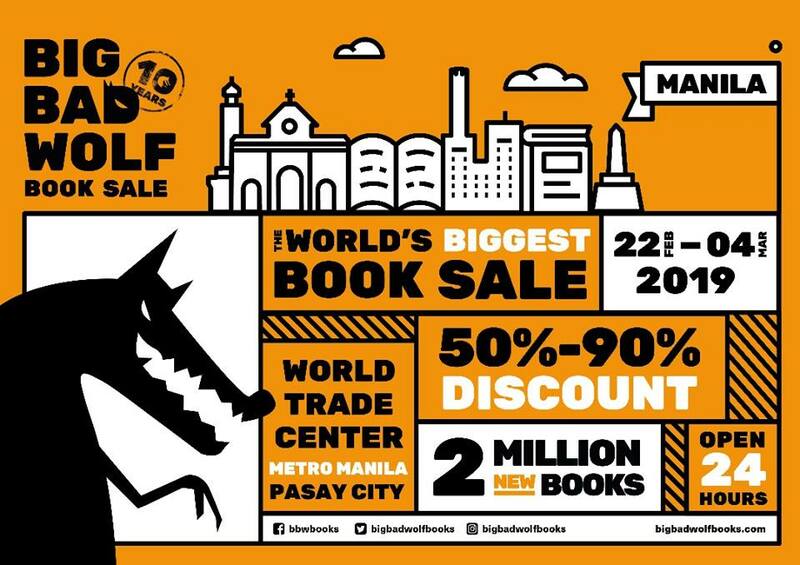 Big Bad Wolf will be heading to the World Trade Centre in Manila’s Pasay City with 2 million books, from February 22 through March 4. Big Bad Wolf debuted in the Philippines last year, and it was so successful they went back twice more. This year even more Philippines events are planned. A look at the Big Bad Wolf Philippines Facebook page is instructive. The announcement was posted January 18 and earlier today, January 21, said announcement had already mustered 17,000 likes, 7,200 comments and over 30,000 shares. Make no mistake, Filipinos love books when they are affordable and accessible. And accessible they will be, for eleven days of 24/7 buying, with huge discounts. There’s a lesson there for publishers. Maybe they need to address their pricing and availability strategies. But that’s still not enough for Big Bad Wolf, who have also announced the start of a nationwide tour across home country Malaysia, starting in February 18 in Pahang, to be followed with Johor on March 21 and Kuching starting March 28. In 2018 Big Bad Wolf shipped a total of 31 million books to its venues and attracted over 3 million visitors. In 2019 Big Bad Wolf plans to double that, shipping 60 million books to 30 cities across fourteen countries. No wonder Big Bad Wolf was the TNPS Story of the Year in 2018.